Archaeologists digging a small island off Cyprus’ western coast have discovered amulets bearing male names, believed to have been worn by male toddlers over 2,000 years ago, it was announced yesterday. 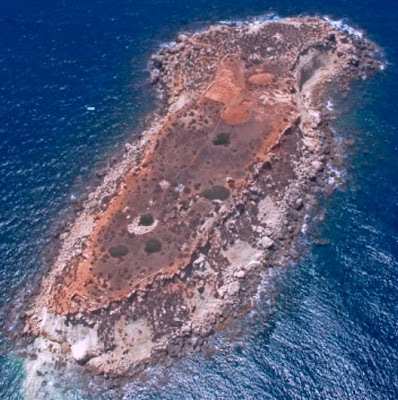 The artefacts were found on the island of Yeronisos, or Holy Island, near Peyia, an important place of pilgrimage during the later Hellenistic period - 325-58 BC - when worshippers crossed the waters to pray at its sanctuary of the god Apollo. A shell also recovered from the site bears the male names Chariton, Thrasayis, Nikkon and Hereas. “These are perhaps the names of boys who participated in the weaning rituals,” the department said. That these amulets were made on Yeronisos is suggested by the discovery, this season, of an unfinished charm, not yet pierced for suspension and not yet engraved with designs. In the north side of the island, archaeologists unearthed a circular platform, which they believe was used for dancing – an integral part of the boys’ education and a means of pleasing Apollo – the Olympian god of music and song, prophecy and oracles. Late Hellenistic pottery excavated this season includes drinking cups, bowls, and juglets. The excavation was undertaken by the New York University Yeronisos Island Expedition, under the direction of Professor Joan Breton Connelly. NYU started exploring the island in June 1990, at around the same time as it was officially declared an ancient monument.